NAND chips may finally be stabilizing in terms of contract prices, at least according to market research company DRAMeXchange. Averages prices for the common 16GB and 32GB chips have grown slightly from about 3 to 6 percent for the latter half of August, while the 32GB 3-bit multi-level cell (MLC) and larger 64GB chips have remained stagnant. DRAMeXchange attributes the flattening prices to a “slight rebound in buying sentiment”, said DigiTimes, and a healthy inventory of NAND chips stocked up by manufacturers. How NAND prices will fare in the coming months, however, will depend on the adoption and production rates of upcoming tablets, smartphones and notebooks. 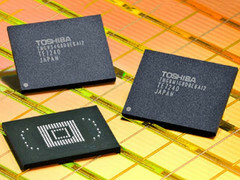 Ultrabooks in particular will help spur additional demand for NAND memory, the source claims. The 2011 earthquake and subsequent tsunami in Japan caused DDR chip prices to rise by as much as 8 percent in April.